Want to help establish a food forest in Frogtown? Enjoy being outdoors while creating access to healthy, local food? We have finished Community Farm Nights for the 2018 season. Thank you to all who joined us in our mission of cultivating soil and community in Frogtown. Join us on the field and learn a bit about growing your own food. On Tuesday evenings from 5:00 to 8:00pm throughout the season, be a part of an operating urban farm by joining the farm crew! 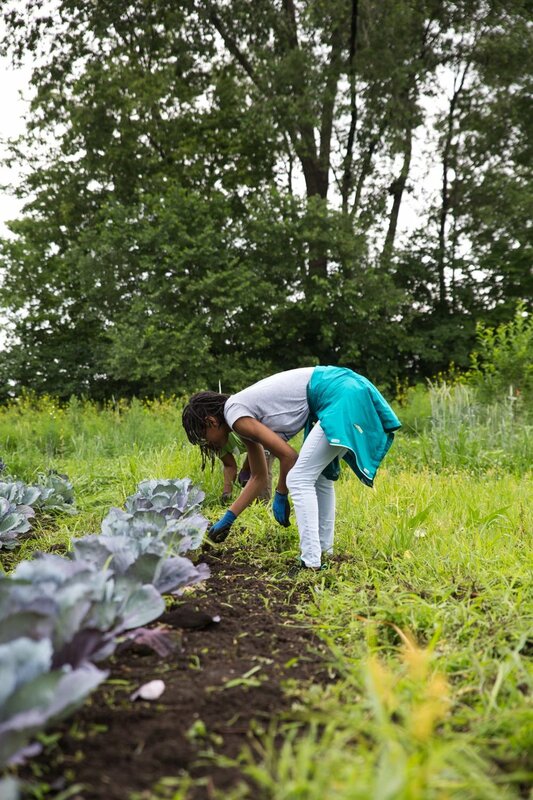 Field preparations, planting, harvesting, weeding, trellising and more happen in a team-work setting lead by Frogtown Farm field staff. This is a family friendly, welcoming, and engaging way for community members to experience the park and farm, support our organic production and explore the variety of crops grown onsite. Frogtown Farm will provide supplies and guidance for visitors to try farming activities. These sessions are drop-in, suitable for almost all ages (children under 12 years need to be accompanied by an adult). All involved will sign a waiver to participate, and those under 18 years should have the waiver signed by an adult. No need to pre-register. We recommend long pants, closed toe shoes, water bottle and if needed - sunscreen and bug repellent. Be prepared to get dirty! Farm work tends to happen in all sorts of weather, so come prepared for the expected conditions for that day. Note: Frogtown Farm cannot guarantee security of personal belongings. It is recommended that you only come with what you can carry with you while in the fields. Frogtown Farm is a public park. Please bring your personal belongings with you as you work in the farm fields or leave them at home or in your car. Do you have a group that wants to volunteer? Check out our field experience page here! All of our farming and events will take place in Frogtown Park and Farm. We are accessed at 946 Minnehaha Ave. W. Saint Paul, MN 55104. Parking can be limited in the Park's small lot, so carpooling, walking, biking, busing or taking the Greenline is highly recommended. There is also street parking along the perimeter of the farm.